Bruce Graham takes us to a time before Walmarts, internet and disco, when there was a very real threat of a cold war. In this high-strung setting we are witness to the behavior of six would be survivors to an unfolding apocalyptic event, their reactions are a study in microcosm of society and ourselves. Please take a night off from the ordinary to enjoy a special night of provocative theater. All shows at 8 PM or Sunday * at the 2 PM matinees. Some shots from rehearsal. 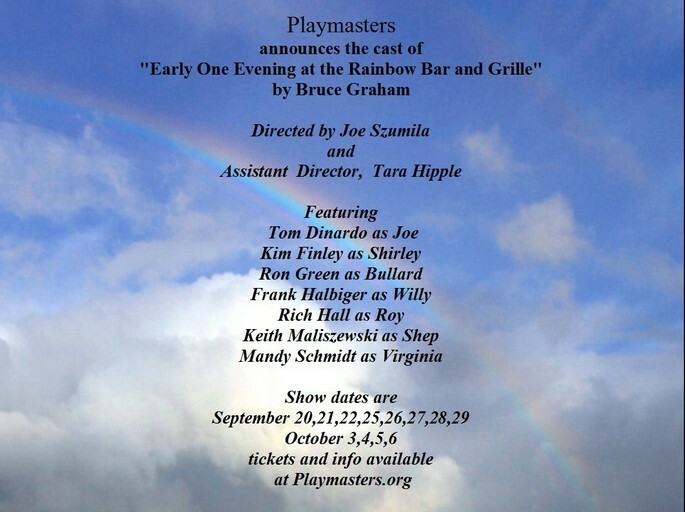 "Early one Evening at the Rainbow Bar and Grille" opens Friday Sept 20.